The 30-minute video released last week by the San Diego-based group Invisible Children calling for action against Ugandan warlord Joseph Kony provided striking evidence that young adults and their elders at times have different news agendas and learn about news in different ways. Those ages 18-29 were much more likely than older adults to have heard a lot about the “Kony 2012” video and to have learned about it through social media than traditional news sources. Indeed, a special analysis of posts in Twitter showed that it was by far the top story on the platform. Moreover, younger adults were also more than twice as likely as older adults to have watched the video itself on YouTube or Vimeo. As of March 13, the video had been viewed more than 76 million times on YouTube and 16 million times on Vimeo, making it one of the most viewed videos of all time on those sites. Special polling and social media content analysis by the Pew Research Center tracks how the “Kony 2012” video and information about it reached so many Americans in a relatively short period of time, and the critical role social media played, especially for adults under age 30. A national phone survey in the days following the video’s release shows that 58% of young adults said they heard about the video, including 40% who said they heard a lot about it. That compares with 20% of those ages 30-49 who heard a lot about it; 18% of those ages 50-64; and 19% of those ages 65 and older. Even more striking is the way people learned about the story: 27% of young adults first heard about it through social media such as Facebook or Twitter and another 8% learned about it via other internet sources. The internet was more than three times more important as a news-learning platform for young adults than traditional media such as television, newspapers, and radio. Some 10% of young adults first learned about the video via traditional media platforms. For those ages 30-49, the mix of news sources was about even: 22% first learned of the “Kony 2012” video from internet sources – 15% via social media – and 21% learned from traditional media sources. Those 50 and older were much more likely to have learned of the video from traditional sources, especially television: 29% of adults ages 50-64 heard from television, newspapers, or radio, compared with 12% who heard via the internet. For adults age 65 and older, 47% learned about it from traditional sources and 5% learned from internet sources. All those figures above apply to all adults in those age cohorts. If one examines the adults who had heard about the video, the numbers shift even more dramatically for social media as the top source for young adults. The figures, though from a relatively modest number of cases, suggest that perhaps half of adults 18-29 learned of the video from social media and, overall, nearly two-thirds heard first about the video from some online source. Word-of-mouth was also a noteworthy source for those under age 65. Some 9% of young adults learned of the video by talking with someone, 7% of those 30-64 also first heard of it during a conversation, and 2% of those 65 and older learned of it that way. In addition to hearing a lot about the video, young adults were much more likely than older adults to have watched the video: 23% of adults ages 18-29 watched it, compared with 11% of those 30-49, 8% of those 50-64, and 13% of those 65 and older. The organization’s effort to promote the video by social media was very successful. Invisible Children noted that one of its goals in launching the video was to capture attention for it through campaigns in social media to encourage celebrity Twitter users to post about it. Those who did tweet included Oprah Winfrey, Ryan Seacrest, Justin Bieber, Alec Baldwin and Taylor Swift, and the campaign was saluted by White House Press Secretary Jay Carney, who said President Obama offered his congratulations for calling attention to the campaign to stop Kony and his army. An analysis by the Pew Research Center’s Project for Excellence in Journalism found that there were nearly 5 million tweets about the video in the week after it was posted online on March 5. The Invisible Children video portrays Kony and his Lord’s Resistance Army as a brutal force that kidnaps children to become soldiers. And the narrator, Jason Russell, asks viewers to participate in the anti-Kony movement by contacting politicians, donating money and putting up posters. In recent days, however, the tone of the conversation has shifted a bit. The first two days after the video was online, when attention on Twitter was relatively modest, 77% of the Twitter conversation was supportive compared with only 7% that was skeptical or negative. Since March 7, when the response picked up dramatically, the percentage of tweets reflecting skepticism or criticism rose to 17%. Some of the positive responses came from notable celebrities whose posts were widely retweeted. A large amount of the awareness of the documentary can be traced to Oprah Winfrey. After she began tweeting about the film to her 9.6 million followers on March 6, the amount of attention skyrocketed. According to Invisible Children, the video had about 66,000 views during its first day online. But the next day, when Oprah began to further publicize the effort, it received more than 9 million views. “Was going to sleep last night and saw ur tweets about #StopKony…watched in bed, was blown away,” added television host and radio personality Ryan Seacrest. Millions of other Twitter users followed suit. “Nothing is more powerful than an idea whose time is NOW. Please watch and share this video,” wrote Sarah, aka @yems28. The mainstream media also picked up on the video, and the reaction to it, with coverage on all three evening network newscasts on March 8. That was followed by a page one March 9 New York Times story headlined; “Online, a Distant Conflict Soars to Topic No. 1.” And some reporters and commentators began to raise questions about the film. And although it never became the dominant element of the conversation, some of those critiques began to surface on Twitter. “Kony hasnt been seen in 4 years.. his army hasnt done anything in 6 years… so Invisible children will raise all this $ n still not find him,” predicted @AudraTheRapper. That in turn, generated something of a backlash of its own. 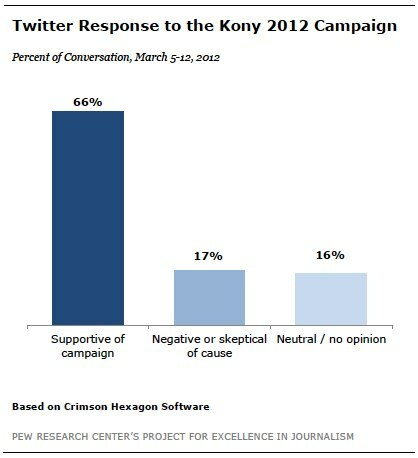 “Sick of cynical people commenting negatively on the stop Kony movement. Even if there are flaws, raising awareness can NEVER be a bad thing,” tweeted Shanice Dee.